Phenome, Other Virtual Intrument from Prodyon. Prodyon has announced the release of Phenome, an eight-part multi-timbral SoundFont Player VST instrument. 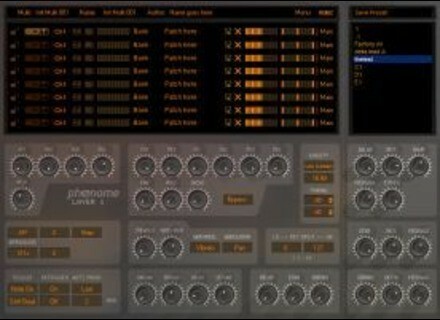 Phenome is an eight-part multi-timbral SoundFont Player VSTi. Selectable MIDI channel for each layer. Loading and saving of multi-setups. Selectable keysplit for each layer. Built in phrase arpeggiator with step/gate mode. Built in stereo delay, mono delay and chorus. 8 stereo (16 mono) audio outputs. 256 voice polyphony (8x 32 voices). MIDI learn for any knob/fader/dial. Low CPU usage / low RAM overhead. 500 MB factory library available via download. NTS Audio Benassi Bass NTS Audio has released Benassi Bass, a customized "Benassi bass" virtual analogue synthesizer that follows the techniques Benny Benassi used to synthesize his specific type of sound. Fsynthz Sandra Fsynthz has released Sandra, a hybrid AM+FM subtractive synth specially designed to produce low rezo sweeps and drones. Jack OS X Updated Jack OS X was recently updated to version 0.86, which addresses several issues in the CoreAudio driver, especially when used with Apogee cards.